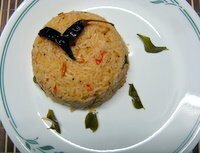 Tomato rice recipe is a very common and popular south Indian rice recipe. It is commonly made in the everyday cooking, especially in the state of Tamil Nadu (India), where it is known as thakkali rice or thakkali sadam. 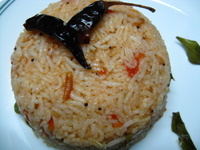 The recipe given below is tomato rice south Indian style. It can be an ideal choice for a quick lunch. The tangy tomatoes and flavors of other herbs and spices make this rice a tasty treat. You can even make this with any leftover boiled rice. Usually this recipe is made very hot by using dry red and fresh green chilies. You can make it as hot or as mild as you want. Kindly note:-It is important that the rice you use for this recipe is almost cooked but not cooked through. Boil it till it is almost done and strain the rice and spread it on a flat tray to cool down, in order to stop further cooking. If you overcook the rice, when you add it in the tomatoes it will cook further and become very soggy. That's not the texture you are looking for. Each grain should be separate. Heat the Ghee in a pan or kadai (non stick is best). Add the mustard seeds and when they sputter, add the cumin seeds and red chilies. Saute on a low flame for 30 seconds. Now add the chana dal and saute till it gets little pink. Now add the urad dal and on a low flame saute till it gets light pink. Add the ginger-garlic, green chili, curry leaves and hing. Saute further for a minute and add the tomatoes. When the tomatoes are soft, add the salt and check the taste. Add a little red chili powder if not hot enough. Finally and the rice and on a high flame, mix well. Serve hot and enjoy the hot and tangy rice.